There are a handful of recipes that have been with me since I started giving cookery classes. This is one of them. My husband, Richard, and I were living in an apartment that had an open plan kitchen. Paddy Moloney of “The Chieftains” was our ridiculously generous landlord and instead of forbidding my business idea, he went out of his way to encourage it. The classes were demonstration only, with the punters in an arc around the counter. They wanted practical ideas that could be picked up after a single viewing, taking into account the distraction of a fair amount of chat and banter. This was the first recipe I taught to the first group (which included a few friends and neighbours to bulk up the numbers). It is adapted from the recipe given in Richard Olney’s “Simple French Cooking”. The ricotta and Parmesan mixture that is poured over the top soufflés a little in the oven, creating a puffy, golden topping. It can stand on its own or accompany any number of dishes. I love it as much now as I did then. Preheat oven to 220˚C, 200˚C Fan, 425˚F, Gas 7. Heat the olive oil in a medium saucepan and add the chopped onion. Season with salt, cover with a lid and reduce the heat. Cook the onions for about 10 minutes until softened, stirring regularly. Add the garlic, cook out for a couple of minutes and then mix in the tinned tomatoes and sugar. Season. Simmer until the tomatoes have reduced to a thickish sauce, about 30-40 minutes. Slice the aubergine into rounds about 5mm thick. Pour some olive oil into a ramekin or small bowl and, with a pastry brush, paint both sides of the aubergine with the oil. Place the aubergine slices in a single layer on a baking tray (use a silicone mat if you have one). Season each slice. Roast in the oven for about 20 minutes, turning the aubergine slices over half way through the cooking. Cook until they are lightly coloured and totally tender. If they look a little dry when you turn them, paint the surface again with some olive oil and return to the oven. Place the ricotta in a small bowl and break up with a fork. Beat in the egg and cream. Season and stir in a good fistful of Parmesan cheese and a few shredded basil leaves. 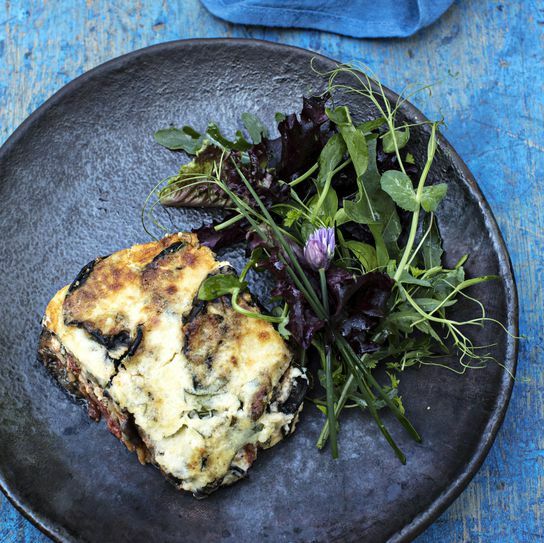 Place a layer of overlapping aubergine slices in the bottom of the gratin dish. Spoon over a thin layer of tomato sauce. Scatter over some basil and a very light sprinkling of Parmesan cheese. Repeat, finishing with a layer of aubergine. You will not need all the tomato sauce for this recipe so keep any extra for another use. The gratin may be prepared up to this point in advance and refrigerated. Just before placing in the oven, pour the ricotta mixture over the top and sprinkle with a dusting of Parmesan. Bake in the oven for about 25 minutes or until golden brown on the surface. My preference would be to griddle the aubergines for this dish rather than roasting them in the oven. To griddle aubergines, preheat the griddle until very hot and beginning to smoke. Slice the aubergines about 5mm thick. Paint one side with olive oil and place this oiled side down on the hot griddle. Leave the aubergines to cook until they become charred and lose their white fleshy colour. Paint the top side with olive oil, season with salt and then turn over and cook in the same way. If the aubergine slices still remain white between the griddle lines, then they are not yet tender and will require further cooking. At the end they should have a soft and yielding flesh. This is what makes them taste utterly delicious. A variant of this gratin is the Italian dish Aubergine Parmigiana. The aubergines are griddled until fully tender (as above), then placed in overlapping layers in a gratin dish with tomato sauce. Each layer is topped with basil, a dusting of Parmesan and a few slices of mozzarella cheese. It is baked in the oven until the sauce is bubbling and the cheese melts and oozes into the tomato sauce.